What is the Attraction of Our Retirement Communities to Residents of New Jersey? New Jersey certainly can be a fine place to live, work, and perhaps raise a family. However, New Jersey residents of retirement age are increasingly exploring the benefits of buying a home in warmer, sunnier climes and living in the Sun Belt region either year-round or part time. At Blair Group, our mission is to facilitate an active adult lifestyle through the provision of affordably priced manufactured housing along with excellent amenities and professional onsite community management. This community in Lakeland is situated on 1,000 beautiful acres boasting stately cypress trees, sparkling ponds, a recently renovated clubhouse complex, and two professionally maintained 18-hole golf courses. Located on the southern shore of 7-mile-long Lake Griffin, this community is a nature lover’s paradise. It has a 55-slip marina, fishing pier, boat launch, and boat storage facility, as well as a screened outdoor pool, observation deck, fitness center, shuffleboard courts, and more! Residents of Bear Creek in Ormond Beach are virtually never without something fun and invigorating to do. This community has three clubhouses, three pools, scenic walking trails, and a wealth of amenities. There is also a public golf course next door and the Atlantic beaches are just a short car ride away. Hyde Park is a 55+ lifestyle community located in Winter Garden – just 13 miles west of Orlando. The charming Downtown Winter Park Historic District is also easily accessible from this community via golf cart! Two clubhouses. Indoor and outdoor pools. Tennis and pickleball courts. Bingo. Billiards. Cards. Group fitness classes. 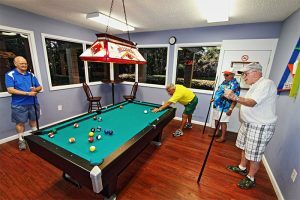 StrawBerry Ridge – near Tampa – has just about everything an active older adult could want. For more information, contact Blair Group today. A member of our Lifestyle Team will be pleased to tell you all you wish to know about our splendid retirement communities, as well as provide you a current listing of homes for sale at each.